In each generation, there is raised up by God one dominant voice in the church that speaks with greatest biblical authority and theological profundity, yet with far-reaching appeal. Through his prolific pulpit and pen, such a pivotal figure becomes the primary instrument that most influences the direction of God’s work around the world. Whether it be John Calvin in the sixteenth century, John Owen in the seventeenth, Jonathan Edwards in the eighteenth, or Charles Spurgeon in the nineteenth, every hour of human history has one such strategic leader who marries both depth and breadth of ministry, and most impacts the times in which he lives. For the twentieth and twenty-first centuries, a compelling case can be made that these two individuals are, respectively, Martyn Lloyd-Jones and John MacArthur. Through Lloyd-Jones’ prolific Westminster pulpit in London, and later by the global distribution of his printed sermons, this formidable leader came to be widely regarded in his day as “the greatest preacher in Christendom.” Affectionately known as “the Doctor,” this brilliant physician-turned-preacher became the foremost expositor in the mid-twentieth century and was the leading influence in bringing about a resurgence of biblical preaching. 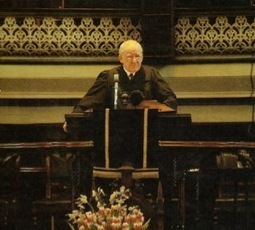 “There is little doubt,” Eric J. Alexander writes, “that Dr. Martyn Lloyd-Jones was the greatest preacher the English-speaking world has seen in the twentieth century.” Through his strategic pulpit, only a short walk from Buckingham Palace, Lloyd-Jones spoke to the nation and impacted the evangelical church around the world. With unflagging confidence in Scripture, this fiery Welch-born preacher burned like a bright torch in a day that had witnessed “the decline in powerful biblical preaching in the English-speaking world.” Despite contemporary trends to the contrary, Lloyd-Jones staunchly refused to cave in to the many pressures around him that clamored for man-centered programs to attract a crowd. While others looked to church growth techniques, this feisty Puritan-born-out-of-due-time relied chiefly upon the exposition of the Word to build the church. In spite of his many skeptics, Lloyd-Jones eventually preached to capacity crowds of 2,500 on Sunday mornings and evenings and 1,200 each Friday evening. Throughout his ministry, Lloyd-Jones emphasized that the preaching of the Word must always be the priority. Oliphant Old states, “The greatest impact of Lloyd-Jones on the English-speaking pulpit of today is the recovery of true expository preaching.” In addition, Lloyd-Jones founded the Banner of Truth Trust, a publishing house for the distribution of Puritan and Reformed literature. Moreover, he chaired the annual Puritan Conference and moderated the Westminster Minister’s Fraternal, leaving an indelible mark upon the Christian church. As Lloyd-Jones stepped down from his Westminster pulpit on October 9, 1968, none could have known that at that moment, the next strong voice was being raised up across the Atlantic Ocean, one that would continue this same resurgence of biblical preaching. On February 9, 1969, only four months after Lloyd-Jones resigned his pastorate, a twenty-nine year old preacher assumed the pulpit of Grace Community Church in Los Angeles, California and launched what would become more than four decades of prodigious sermon output. His name is John MacArthur, and like Lloyd-Jones before him, the focal point of his prolific ministry would be the clear and compelling exposition of the Scripture. Under his preaching, Grace Church would witness explosive growth from the 300 who first heard him in a small chapel to two morning services and one evening service filled to capacity its newly-built 3,000-seat auditorium. As with Westminster Chapel, so Grace Church would witness the unmistakable power of the Word of God preached. The influence of MacArthur’s preaching has reached far beyond the walls of Grace Community Church, gaining “a reputation for solid expository preaching.” Flowing out of this pulpit has come nearly 400 books and study guides either written or edited by MacArthur. Included in this prolific ministry came the MacArthur New Testament Commentary Series, a thirty-one volume commentary set that when completed,will address every verse of every book in the New Testament. What is more, the MacArthur Study Bible is the direct fruit of this prolific pulpit and has become the cornerstone resource of his ministry, available in English, Spanish, Russian, German, French, Italian, Chinese, Arabic, with more languages on the way. Reaching around the globe, the Grace pulpit has truly become a world pulpit, exerting an influence of staggering, if not unprecedented, proportions. Through “Grace to You” radio broadcasts, MacArthur’s sermons are heard daily some 1,000 times throughout the English-speaking world in the United States, Canada, Europe, the Philippines, South Africa, and beyond. In addition, his sermons are heard another 1,000 times daily in 23 Spanish-speaking countries, including Mexico, Spain, Argentina, Chile, Peru, Venezuela, and Columbia. Moreover, under this far-reaching pulpit, The Master’s Seminary was birthed in 1986 for the purpose of training men in expository preaching. Remarkably, a series of fourteen training centers have emerged around the world, known as The Masters Training Academy International (TMAI). These institutions are mostly staffed by TMS graduates and are designed to equip a new generation of biblical expositors throughout the world. In the summer of 2011, MacArthur will complete his verse-by-verse exposition through the Gospel of Mark, which will mark a far greater milestone—the completion of his preaching at Grace Community Church through the entire New Testament. This monumental achievement of long term, consistent exposition will become a model inspiration and resource for pastors and teachers for generations to come. So remarkable is this accomplishment that one must go back to the voluminous output of Calvin in Geneva to find a comparable standard. Lloyd-Jones and MacArthur have proven to be, arguably, the premier expositors of the last two generations. What Lloyd-Jones was to the middle of the twentieth century, MacArthur has become to the end of the twentieth and beginning of the twenty-first centuries. Though these two luminous preachers would never meet, and each would be his own man, many striking parallels can be identified between their pulpit ministries. The common ground shared by these two gifted preachers should serve as a positive example for all preachers to pattern their ministries. If you are in my neck of the woods (North Alabama-Tennesse Valley) this weekend (Aug 26-28), Bruce Ware will be leading a conference at Grace Church-Huntsville on the Trinity. The conference is free but we ask that you register so we can plan accordingly. If you are a pastor and want to attend a special leadership luncheon with Bruce on Saturday, please contact me (see my address under “contact” at the top of this site). I hope to see you there.